There is a range of what we mean by worship. 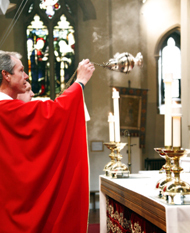 As a parish we frequently take part in formal worship together, known as liturgy - an example of formal worship is the Mass. But we also gather together for times of informal worship in different prayer groups etc. Each year the Church celebrates the rhythm of the seasons of the liturgical year – always the same, yet ever new and renewing. At the heart of this yearly cycle is the Sacred Liturgy, especially the celebration of the Mass, which is the source and summit of the Church's life. Annually the Church immerses herself in the whole mystery of Christ, from the incarnation and birth until the ascension, the day of Pentecost, and the expectation of blessed hope and of the coming of the Lord. For more information on our times of more informal worship, please see our prayer & formation groups. To request a Mass intention please use the contact form on the Contact Us page or email us. Find out more information from our Request Mass page. Also by appointment with the Parish Priest. The Ascension - Thursday May 10th. The Mass times for this Holy Day of Obligation will be at 12noon (regular time) and at 6.30pm. This is because the Alpha course will start at 7pm in the Parish Room.